Tooth cavities mean a drillin’ and a fillin’! But imagine no drills, no needles, no anaesthetic and no fillings – just a micro sponge soaked in a special solution which is inserted into the cavity. Several weeks later the sponge has dissolved, the cavity is gone, and your tooth is fully restored and remineralised. Imagine no more. Science fiction is now fact. Earlier this month, a team of researchers at King’s College London published research showing that they had discovered the impossible – natural tooth repair. Granted, your teeth can already self repair – to a degree. In the event of trauma, decay or infection, the soft inner pulp of your tooth can become exposed, and prone to infection. In response, your body produces just enough dentine to seal the tooth pulp and protect it from infection – but not enough to repair the cavity. But what the researchers at King’s College London discovered is a method that taps into this innate ability of the teeth to self repair with reparative dentine. The researchers succeeded in further stimulating the renewal of living stem cells within the tooth pulp. This stimulation generated more dentine – a tooth mineral that forms the bulk of a tooth, beneath a protective layer of enamel. To activate this response, the research team inserted biodegradable collagen sponges (Kolspon) into the cavities, in contact with the pulp. The sponges were soaked in a solution containing Tideglusib – a well-known, clinically-approved drug used to treat Alzheimer’s disease. 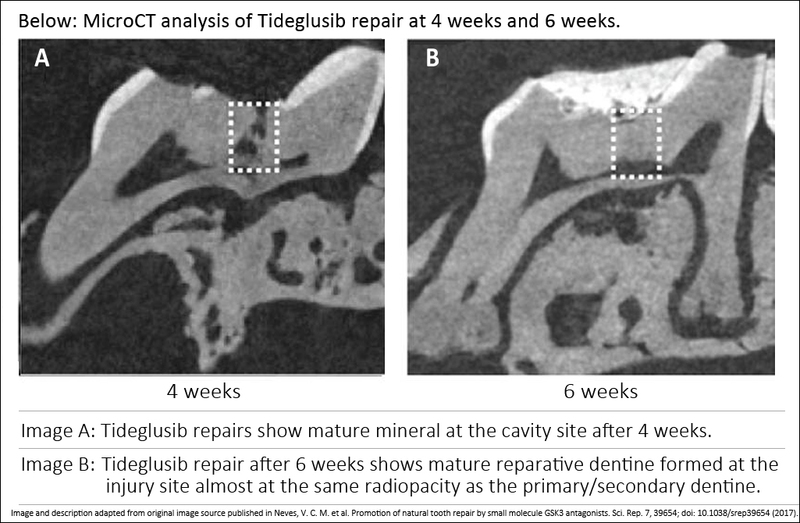 The researchers discovered that small daily doses of Tideglusib stimulated the continuous natural formation of reparative dentine within the sponge over the 6 week test period. Over time, the carrier sponge degraded, leaving behind a reparative dentine structure that filled the entire cavity site – eventually leading to a complete natural tooth restoration. “The simplicity of our approach makes it ideal as a clinical dental product for the natural treatment of large cavities, by providing both pulp protection and restoring dentine,” commented lead author of the study, Professor Paul Sharpe. Neves, V. C. M. et al. Promotion of natural tooth repair by small molecule GSK3 antagonists. Sci. Rep. 7, 39654; doi: 10.1038/srep39654 (2017). Image and image description adapted and edited from original source image format – complies with fair use under Creative Commons Attribution 4.0 International License.